At Western Caskets we believe service to our customers is our greatest strength. We strive to combine the best of both worlds ­high quality products, and, efficient delivery targets­ so you can be assured that no matter how urgent your order is, one way or another, we'll get it to you! Please note, Western Caskets does not sell direct to the public but our products are available through a number of Funeral Homes. The company currently has three vehicles on the road, doing regular deliveries to Funeral Homes throughout New Zealand’s upper North Island. Urgent deliveries, outside the regular timetables, can also be made by special arrangement. An expanding side to Western Casket’s business is supplying products to an ever-growing export market. We now make regular shipments of caskets and ash urns to countries around the Pacific, including Noumea, Tahiti, the Solomon Islands and Samoa. Shipping containers are personally packed onsite at Western Casket’s factory, so all care is taken to ensure minimal damage can occur during transit. 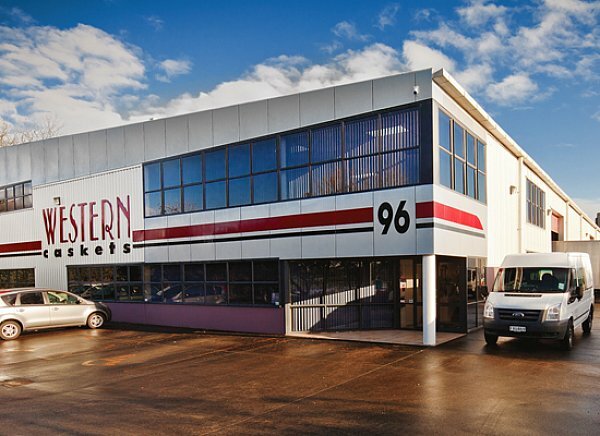 With its modern plant and facilities, and a highly trained and skilled workforce, Western Caskets is capable of extremely rapid production times, enabling us to meet the delivery dates set by even our most distant international customers. An option, also, for overseas customers requiring smaller consignments are their kit-set range of caskets. The components for making up individual caskets are securely packaged and can then be air, or sea, freighted world-wide in any sized order numbers. These kit-sets are simple and easy to assemble, by customers, upon arrival.